Recommended from age of 12 years. A range about 35-45 yd (around 30-40m). Dimensions: 8⅝″ x 7⅞″ (22x20cm). Material: European birch plywood, ⅛″ thick (3mm). Well, what can I say? When I made my first Doubli and threw it a couple of times, I was quite surprise by the distance that it makes. In addition, for this shape and such light weight it has stable and long flight. Boomerang designed by my friend Krzysztof Pietrzak – sport boomerangs propagator in Poland. "I draw this model thinking about Doubling competition. Basically it’s suitable for that. It has a large surface making it easy to catch. Stable for small and medium wind. Flight at an average altitude." 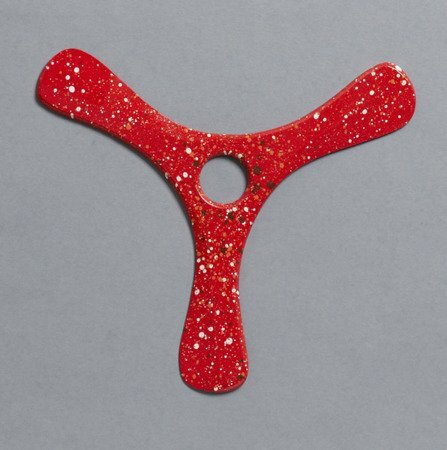 Boomerang designed by Krzysztof around year 2002. Proudly produced by us since 2010. Recommended for 12 years and up. A range of about 35-45 yd (30-40 m).